Michael Anthony Starkey was born on 5 November 1959 in Streaky Bay, South Australia , son of Leonard Nelson Starkey. 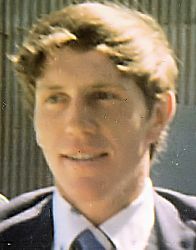 He died on Friday, 3 October 1980, aged 20 years, 10 months and 28 days, in Woodside, South Australia , the result of a car accident. Dorothy Mary Fitzgerald was born on 6 March 1925 in Medindie, South Australia , daughter of Phillip William John Fitzgerald and Mary Anne Josephine Mitchell. Dianne Mary Starkey was born on 22 December 1949 in Streaky Bay, South Australia , daughter of Dudley Lloyd Starkey and Dorothy Mary Fitzgerald.